Songs sung at funerals vary depending on the wishes of the deceased person's family. Sometimes songs hold a deeply spiritual or religious meaning, while others are lighter in tone. Songs, as well as sermons, poetry, Bible readings, music, and eulogies, are all part of both Protestant and Catholic funerals. Usually accompanied by piano, organ or guitar, one or two people will sing a song at a funeral. The song might be a favorite of the deceased, or in the case of the death of a child, a piece that the parents find meaningful and comforting. Most of the songs have to do with faith in eternal life, or the assurance of God's love, provision, and care for everyone. God Be in My Head is a slow, classic hymn that expresses a desire for God's presence throughout life - and at life's end. This is suitable for a traditional funeral service. Written for the funeral of Queen Mary in 1694, Thou Knowest Lord, the Secrets of Our Hearts is a somber, beautiful hymn that may not be well-known in contemporary churches within the United States. Inspired by the popular Bible verse John 3:16, there are many different versions to the song God So Loved the World from which to choose. Find a version matching the tone you want for the funeral, whether that's upbeat or contemplative. This is a positive hymn, focusing on eternal hope. It's a song that is familiar to many people, and for those unfamiliar, it's easy to follow along. This hymn is full of harmonies and may be difficult for those unfamiliar with it to sing properly. O Strength and Stay is a traditional hymn that celebrates the consistent and strong nature of God. As the title indicates, this classic hymn is about drawing closer to God. It's a positive message to help celebrate the life of someone who is now in God's hands. One of the most popular songs is the traditional Amazing Grace written by John Newton in 1779. Since that time, stanzas have been added, and the words to the song are printed in most Protestant church hymnals. Today, Christian musical groups, such as Mercy Me and Third Day, have written songs that many choose to have sung at contemporary funerals. The words to these songs speak of a new life in the presence of eternity. They were inspired by the losses these bands have had in their own lives with deaths that have come too soon. When a young person dies, often these are the songs young adult friends select for the funeral. This moving song is about being a child of God and being welcomed into the Kingdom of God. I Can Only Imagine is about what Heaven will be like and offers hope to those grieving that their loved one will be content in the afterlife. This song takes the focus off grieving and instead focuses on praising God. How Great Is Our God can help those grieving to praise God for the time the deceased loved one spent on earth and turn their focus to eternity. Years ago, there was controversy in Rhode Island about whether the Irish-American ballad, Danny Boy, could be sung at a Catholic funeral. The Catholic church said it could not because of its secular nature. Generally, the Catholic church believes that songs should be uplifting and create a spirit of hope among the grievers. 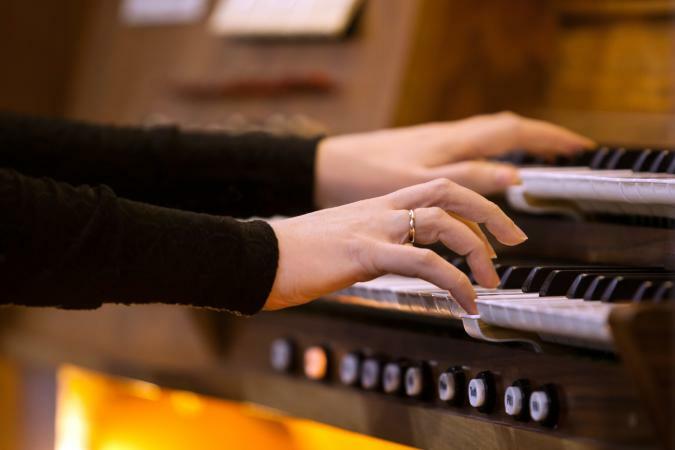 An organist, instruments and even a choir, should lead the congregation in the singing of triumphant songs, based on resurrection and forgiveness. What is the tradition of singing songs at funerals? African-Americans in slavery sang gospel songs when they held funerals for loved ones. Dirges, known as solemn songs expressing mourning and grief, have been sung during funeral processions in many countries. The New Orleans tradition is a unique funeral procession rising from African and French traditions. A march by friends and family begins from the home, church or funeral home with loud instruments, usually a jazz ensemble. The elaborate procession makes its way through the town, ending up at the burial ground. Onlookers are even able to join this colorful ceremony. Choirs, over the years, sing selections about Christ's victory over death and selections based on Psalm 23. Oftentimes, mourners at the funeral are asked to join in singing a stanza from a well-known hymn. Done tastefully, and with respect to the family's wishes, songs sung at funerals can bring comfort and hope to those grieving the loss of a loved one. They can evoke emotions, as well as share some aspect of faith of the person whose death and life is being honored.